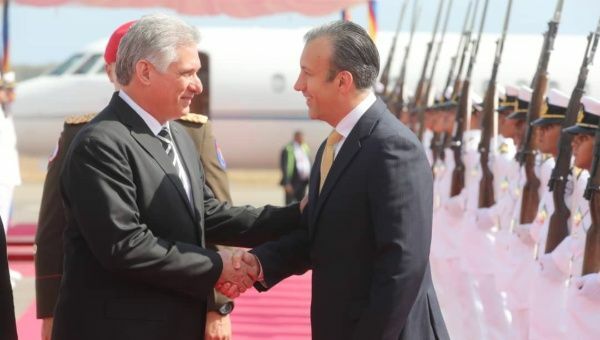 Diaz-Canel Arrives in Venezuela for Official Visit. The during the visit Diaz-Canel will meet with Maduro to discuss strengthening the brotherhood between the two countries. Cuban President Miguel Diaz-Canel arrived in Venezuela Wednesday in his first visit to the South American country since he became President in April. The during the visit, which is also Diaz-Canel’s first international trip since becoming president, he will meet with Venezuelan President Nicolas Maduro to discuss strengthening the brotherhood between the two countries. Díaz-Canel, who was received at Simón Bolívar International Airport, in Maiquetía, Vargas state, by Venezuela’s Vice President, Tareck El Aissami, and Foreign Minister Jorge Arreaza, will also visit.